On the northern Indiana prairie where I was raised in the 1950s, a seamless blend of Christianity and patriotism had been achieved. 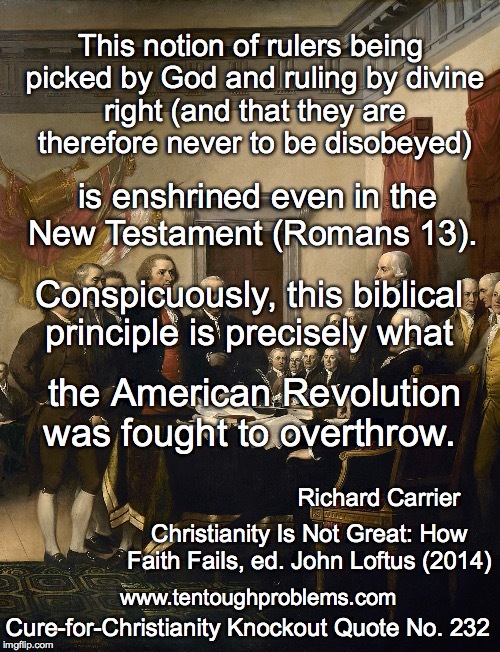 We were up against Godless communism, after all, so what could make more sense? One of our daily newspapers was The Indianapolis Star, whose masthead included words from II Corinthians 3:17: “Where the Spirit of the Lord is, there is liberty.” The editors of the paper no doubt assumed that the apostle Paul and Patrick Henry were kindred spirits. 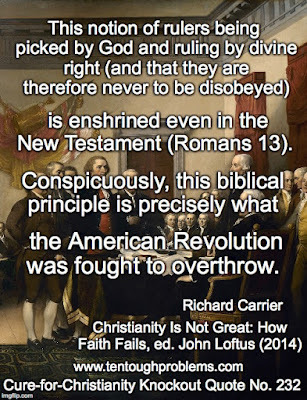 But in fact Paul was not writing about liberty as Henry understood it. The last thing Paul had in mind was freedom from human tyranny. These comments are my way of breaking it to you that we have arrived at Chapter 13 of Paul’s Letter to the Romans. I have been offering a tour of this mash-up of bad theology during the course of the year, chapter by chapter. So now we turn to Paul’s observations in this text; his words here seal his reputation as a mediocre thinker. “For rulers are not a terror to good conduct, but to bad. Do you wish to have no fear of the authority? Then do what is good, and you will receive its approval; for it is God’s servant for your good. But if you do what is wrong, you should be afraid, for the authority does not bear the sword in vain! It is the servant of God to execute wrath on the wrongdoer” (vv. 3-4). • He was a devout Jew, steeped in the ancient traditions of Judaism, where kingship was the ideal. Authoritarianism was the norm; indeed, “follow my law or else” was Yahweh’s consistent message to Israel. • In writing to the church at Rome, Paul might have been playing it safe, in case the letter fell under the eyes of Roman censors. If there were suspicions about the Christian cult, these words were designed to allay fears. • Paul’s theology-soaked brain blocked rational thought in crucial areas (a dysfunction that hobbles apologist thinking to this day). • Paul was confident that the “authorities” were about to be destroyed—so why not give them their due in the meantime? Always keep in mind that Paul was so sure that Jesus would soon descend through the clouds to set up his own kingdom. The time was growing short; he assured his followers that their dead friends and relatives—those that had believed in Christ, that is—would rise from there graves to meet Jesus in the sky (I Thess. 4:16); he told them as well that they would soon be judging angels (I Cor. 6:3); he advised that married men should now act as if they didn’t have wives (I Cor. 7:29)…to be in full preparedness to meet the Lord. Salvation is nearer…put on the Lord…make no provision for the flesh. This is cult babble. Government is God’s servant “to execute wrath on wrongdoers.” Didn’t the Roman authorities do something pretty nasty once upon a time to a Galilean preacher? It seems Paul knew less about Jesus than we do. You’d think he’d never heard that the Romans put Jesus to death, e.g., the trial, the role of Pontius Pilate, the taunting of Jesus, the scourging and crown of thorn. It wouldn’t be rash of our Bible Sherlock to say that Paul didn’t know these stories at all. Indeed this is one of the problems that has vexed New Testament scholars for a long time. Paul betrays very little knowledge of the real man Jesus of Nazareth…if there was one. This is a big blank in his teaching. Paul swooned over the Jesus Christ whom he encountered in visions (for those outside the cult, read: hallucinations). Paul was permanently off his meds. • Maybe the gospel stories about Jesus hadn’t been invented yet. • Maybe there wasn’t any oral tradition that New Testament scholars are so heavily invested in—as a way to underwrite the “authenticity” of the Jesus accounts. Paul was so well connected in the early church—yet he failed to relate stories about Jesus that supposedly were traveling the grape vine. • Maybe Paul didn’t even care about what Jesus taught. His obsession was belief in the Risen Christ—and that alone—because that was his formula for achieving eternal life. • Then there’s the special pleading offered by apologists: maybe Paul just “happened not” so say anything about Jesus of Nazareth in all of his letters—because it was off-topic. That really is a stretch. Just like Jesus, right? In Matthew 22:21 Jesus says, “Render therefore to Caesar the things that are Caesar’s, and to God the things that are God’s.” What a great time for Paul to quote Jesus as his authority, his backup. Why didn’t he do so? For one thing, Matthew’s gospel hadn’t been written yet, but it’s also entirely possible that Paul had no idea that Jesus had said this. There is no hint in the New Testament that Paul made even the slightest effort to find out what Jesus had taught. In Galatians 1:18 he claims to have spent 15 days with Cephas in Jerusalem, but did he learn anything? He seems to brag that, no, he didn’t: “For I would have you know, brethren, that the gospel which was preached by me is not according to man. For I neither received it from man, nor was I taught it, but I received it through a revelation of Jesus Christ” (Galatians 1:11-12). He got it straight from God. So what is the life expectancy of ole Yahweh’s vast data dump—known to us as the Old and New Testaments? Were Isaiah 40:8 and 1 Peter 1:25 on to something: “The word of the Lord endures forever.” There may be one sense in which this is correct: How many aeons will it take for those billions of Gideon Bibles to disintegrate? But smart folks know that there is just so much trash in the Bible—stuff that should never have been included in the canon; that should never have been granted “word of God” status. This prompted Hector Avalos’ comment that perhaps 99 percent of the Bible would not be missed.